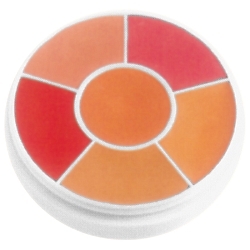 The cream blush wheel gives you the six most popular cream cheek rouges in one easy to use wheel. It is perfect for applying makeup to multiple people quickly without having to change out colors. The cream blush wheel includes the following shades: Carnation Pink, Raspberry, Sandy Rose, Dusty Rose, and Fire Red.